Act it Out! - Guided group work and drama activity, designed to help students bring this dramatic scene of Banquo’s death and murder to life, and to facilitate a critical engagement with this scene in terms of building up tension, the presentation of conflict, drama, and key characters in the play. 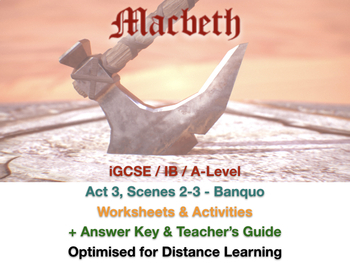 MODEL ANSWERS for all the questions + activities as well as a teacher’s guide and further in-depth analysis and commentary of the Act 3, Scenes 2-3.